With a little baby around and the constant feeling of not getting enough sleep, I tend to drink a lot of diet Coke to make it through the day. The kiddos are always shaking my bottles or trying to grab at them- especially the baby. I've been trying to find a fun Eastery way to recycle them... and came up with this idea last night. I love it because it is a musical instrument AND a snack... all in one. Music shaker for the baby (and 3 yr old) and snack for the 3 yr old. Materials Needed: washed out & dry water/soda bottle, small snacks (we used cheerios, kix, marshmallows, jelly beans, and cheddar bunnies), glue, pink pom pom, scissors, 2 googly eyes, white and pink cardstock, tape, Eastery stickers, and ribbon. 1. Fill your cleaned out bottle with your favorite Eastery snacks. We were going to use a funnel, but using his fingers ended up being a great fine motor skills building task, so we did that instead. He was especially excited about these little cheddar bunnies (and their fruit snack counterpart). We layered each snack and when he was looking I dropped a few Easter egg treats inside for him to discover later. We left some space at the top so that the snacks could move around and make music. Secure the lid in place. 2. Have some fun with your new shaker!! 3. While they are shaking, cut a strip of white cardstock to fit around the bottle (where the label usually goes). 4. Then cut out bunny ears. 5. Tape to the bottle with double stick tape. 6. Cut out pink centers for the ears and tape them on. 7. Add some Easter stickers to jazz up the plastic bottle. 8. Tape on some bunny whiskers using scraps of ribbon. 9. Glue on two googly eyes. 11. Let everything dry... and then start shaking and eating!! It is fun to hear the different sounds as the bottle gets emptier! Unless you wants snacks all over your house, make sure to supervise your child as he eats this snack. The snacks come out in small doses (which is why I like this bottle), but that might frustrate some younger kids. Make sure not to put any snacks inside that you have to squish through the hole... or else they will get stuck and that will be frustrating for kids! ** Also the bunny shaker has little parts glued to it, so only let your little one shake it with parent supervision!! We are excited to make another one of these for an upcoming trip and use it as a little I-Spy treat bottle as well. We'll count the bunnies we see and try and find the hidden Easter eggs. 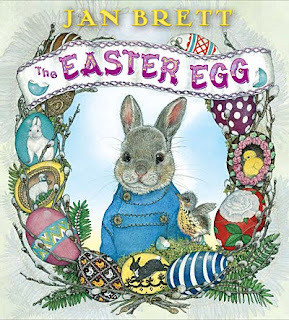 Along with this activity we read our newest Easter book, The Easter Egg by Jan Brett... it has beautiful illustrations and the story is so sweet. We also loved singing this Bunny song from Preschool Express along with this activity! Who hopped around the town. And laid them on the ground. They had a big surprise. I love this idea! I am planning to do these next year with my preschool class. I think I will be writing the poem down though and then I am thinking of hiding some eggs at naptime and letting my students find them when they wake up from thier naps! This is such a cute idea! I love that you can play with it and snack from it. I woul love for you to link this post to Read.Explore.Learn.